"Wine is best in its natural state--when it's a pure expression of its traditions and origins, without the gloss of additives or industrial winemaking." Let me ask you once again: Why aren't you drinking more Greek wines? 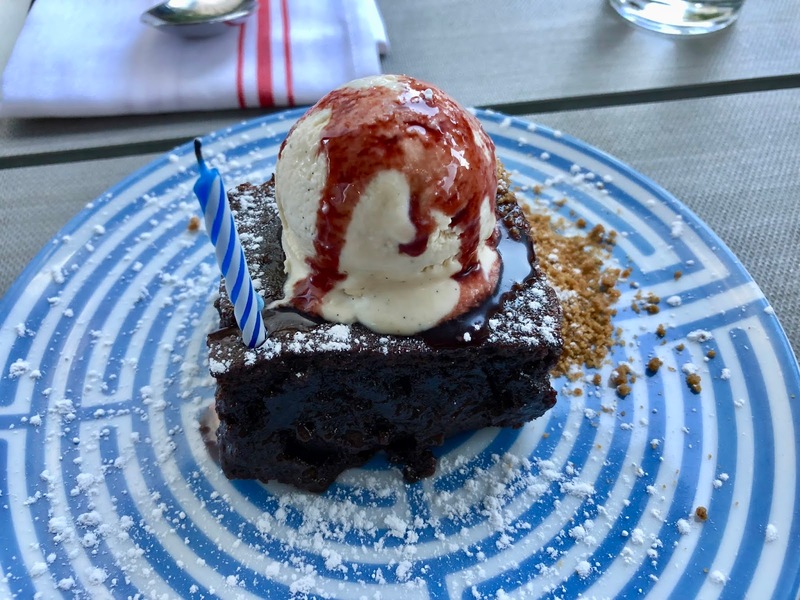 An excellent spot to gain experience with Greek wines is at Committee Ouzeri + Bar, located in the Fan Pier area, and one of my favorite restaurants. As I previously mentioned, Committee has taken a bold step forward, honing their wine list until now it is 100% Greek Wine and 100% Natural Wine. Their wine list is broken down into two menus: By The Glass and By The Bottle, though all of the By The Glass options are also available by the bottle. The By The Glass list includes two Sparkling wines, two Rosé wines, three Whites and 3 Reds (priced $11-$16/glass and $44-$64/bottle). The By The Bottle list has a total of 27 wines, broken down into 11 Whites, 3 Orange wines, and 13 Reds, with 19 wines costing $60 or less. As you can see, their bottles prices are reasonable, with a few splurge-worthy wines at higher price points. The list ranges across the varied regions of Greece, and include wines made from numerous indigenous grapes including Vidiano, Aidini, Roditis, Savatiano, Mandilaria, Limnio and more. Wine Director Lauren Friel has put together a well-focused, diverse, intriguing and delicious wine list. I've previously tasted some of the wines on the list, and all of those wines are excellent choices. In addition this summer, Committee is holding a Natural Wine Bar Pop-Up on their patio every Wednesday night, starting at 5pm, and running through August 29. Each week, they will offer a small list of special Greek wines, which will change regularly, including some rarer selections. At last week's Pop-Up, I attended as a media guest, enjoying the four Greek wines which were offered. The weather was perfect that evening, so it was a delight to sit out on the patio and enjoy some fine Greek wine and food. The patio was quite busy, and I saw a significant number of people enjoying the wines that were being offered. Lauren moved from table to table, describing the wines to those who were interested, sharing her wealth of knowledge and experience. A great opportunity for any wine lover to learn about Greek wine. The full dinner menu is available on the patio so you have plenty of choices to pair with the various wines, and Lauren will give you recommendations if you so desire. I very much enjoyed all four wines that were offered, each providing its own unique taste profile. First, I sampled the 2015 Ktima Parparoussis Assyrtiko ($13 glass/$52 bottle). At an average retail price of $28 retail, the bottle price is less than twice the retail cost which is a good value in the restaurant world. 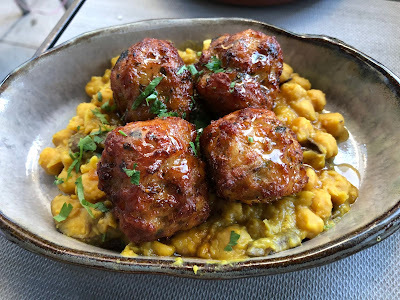 I previously attended a wine dinner hosted by the winery's founder, Athanassios (Thanassis) Parparoussis so you can check out my prior article, Parparoussis Winery & Greek Delights, for background on the winery. I also got to meet Dimitra & Erifyli Parparoussis, the daughters of Athanassios, and taste more of their wines, and you can read about that in An Odyssey Greek Wine Tasting with Cava Spiliadis. From the Achaia region of the Peloponnese, Lauren states this is "Assyrtiko off the beaten path," as most Assyrtiko is from the island of Santorini. 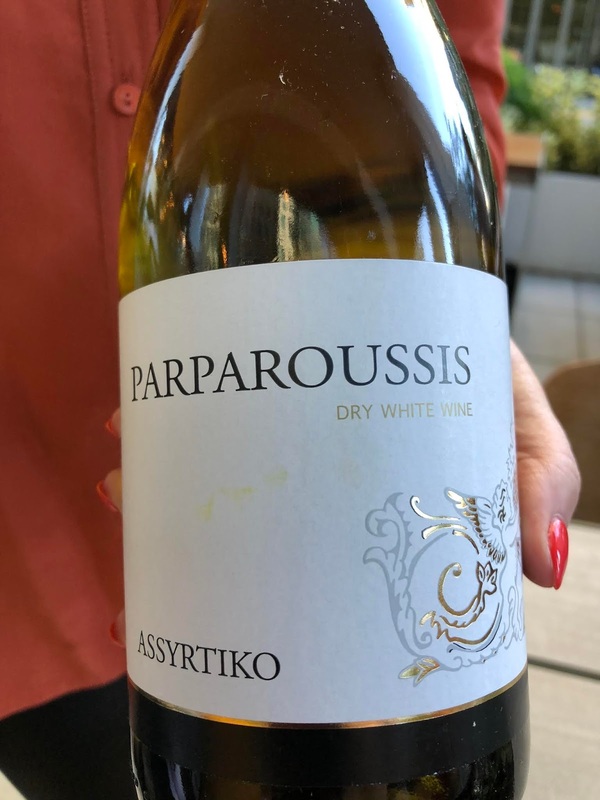 As such, the Parparoussis Assyrtiko has a different profile than most Santorini Assyrtiko, with a fuller body and riper fruit. There are tastes of melon, pear and citrus, with good acidity, and hints of floral notes. There is a nice complexity to the taste and a long, satisfying finish. A very pleasant summer wine, this would go well with seafood, light chicken dishes, and cheeses. 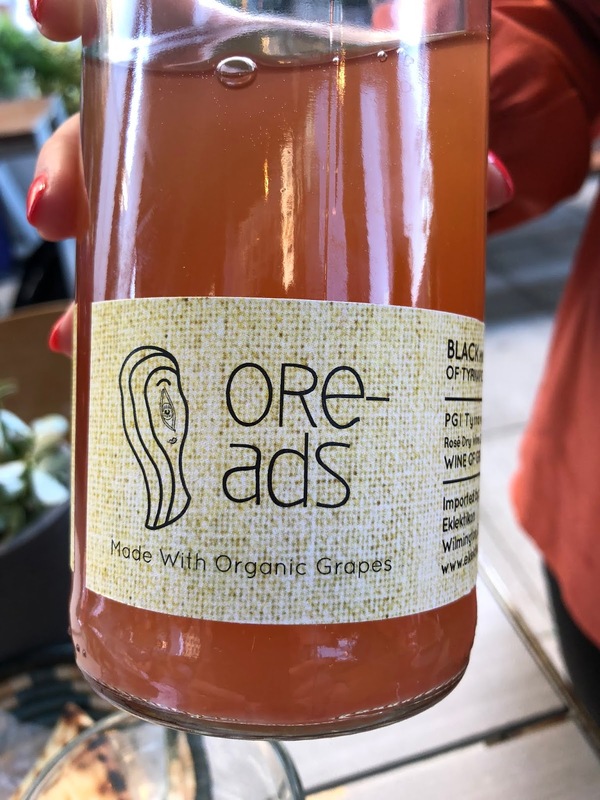 The 2017 Papras 'Oreads' Black Muscat ($11/glass, $44/bottle--about $22/average retail) is produced by Papras Bio Wines, the first winery in Greece to be certified as organic back in 1990. Stergios Papras was the oenologist from the start, and helped to give fame to the grape Black Muscat of Tyrnavos. Though Black Muscat grows in various parts of the world, the grape in Tyrnavos has its own unique characteristics. Tyrnavos sits on a plain at the base of Mount Olympus. The name "Oreads" refers to mountains nymphs in Greek mythology. The Papras 'Oreads' is a rare blanc de noirs, which was vinified in stainless steel, with indigenous yeast and almost no skin contact but 70% of the stems were reintroduced into the fermentation tank and then removed once it was completed. The wine was both unfiltered and unfined, which accounts for the cloudy nature of its appearance. On the nose, there is a strong aroma of Muscat spice and they too are prominent on the palate as well. The palate is more savory, with subtle notes of peach and citrus, and a touch of spritz. A very unique flavor and texture profile which should appeal to wine lovers seeking something different. 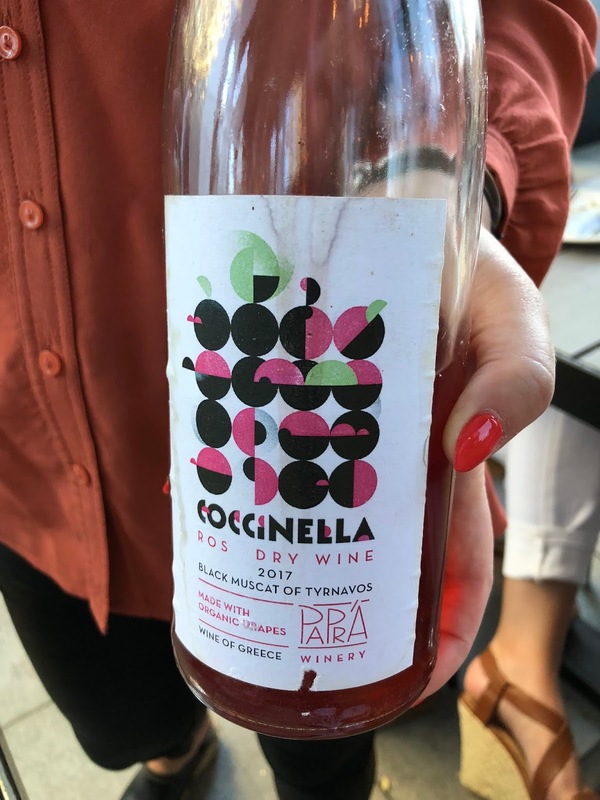 From the same winery as above, the 2017 Papras 'Coccinella' Rosé ($11/glass, $44/bottle) is also made from Black Muscat of Tyrnavos. This wine was fermented, with indigenous yeast, in stainless steel and was a surprising wine to me. The nose presented with alluring and bright red fruit aromas yet on the palate, the wine was much more savory and spicy, with only subtle red fruit flavors. Such a dichotomy between the aromas and taste, but that isn't a bad thing. The taste was complex and intriguing, delicious and intense. Definitely a Rosé to slowly savor, marveling in each sip, especially while sitting on a patio on a fine summer evening. 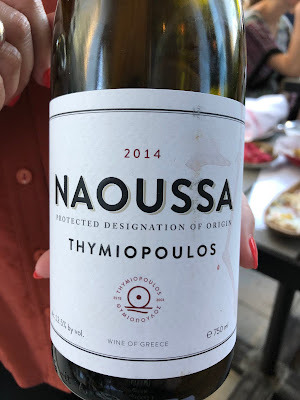 The 2014 Thymiopoulos Naoussa Xinomavro ($12/glass, $48/bottle--about $25 average retail) is produced by a family which has owned vineyards in this region for several generations, selling their grapes to other wineries. It was only recently though that Apostolos Thymiopoulos, upon his graduation with a oenology degree from the University of Athens, started their own label Thymiopoulos Vineyards. Lauren told me that this was one of her top favorite Greek wines of all time. The wine is made from 100% Xinomavro, from 30 year old vines, and it spent about twelve months in oak. It is unfiltered and has a low 12.5% ABV, making it easy to have a second or even third glass. It has a nice, dark red color with a compelling and complex nose of red fruit, earthy spice, and a touch of vanilla. On the palate, it is silky smooth and elegant, with well-integrated tannins and excellent acidity. The complex melange of flavors include ripe plum, cherry, olive, and vanilla, with elements of earthiness and deep spice. It is full bodied with a delightful, lingering finish. An excellent and well-balanced wine, I highly recommended it! I'd be remiss if I didn't mention some of the delicious food I enjoyed while sipping these wines. The Feta ($14), which is sesame encrusted with honey, is a perennial favorite, with that crispy, nutty coating, and the salty feta balanced by the sweetness of the honey. 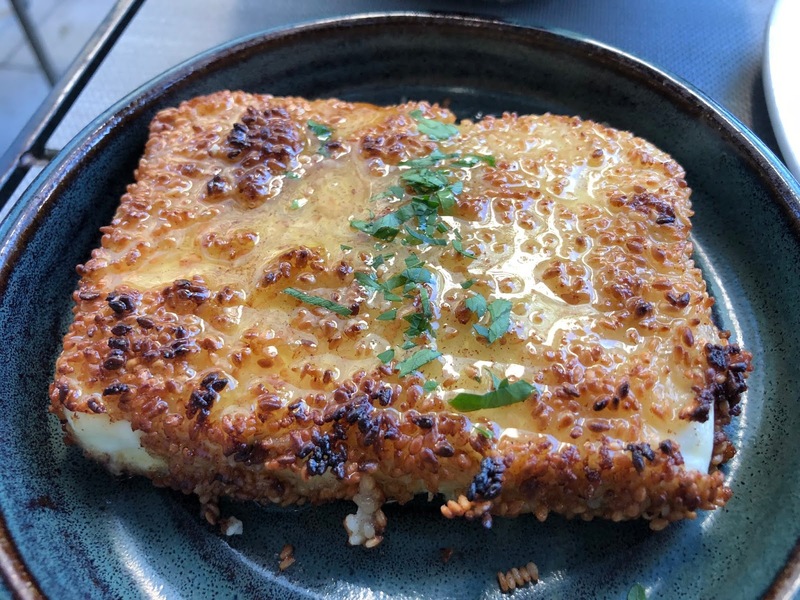 It is hard not to order this dish every time I dine at Committee. 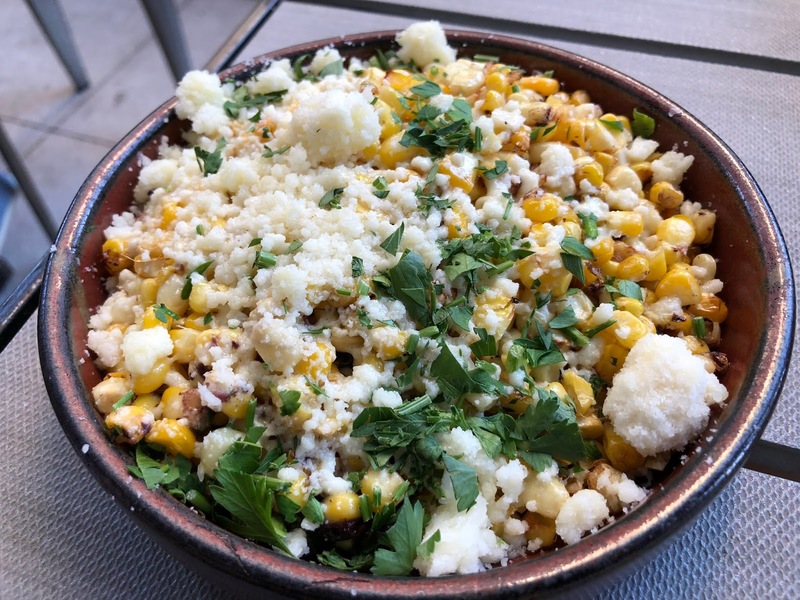 A new dish for me was the Kalamboki ($10), which is an ample-sized dish of sautéed corn with Kalamata olive butter and shaved graveria (a Greek cheese). Quite tasty, there was a nice blend of sweet butter with the salt of the cheese and the olives. It elevated the corn to become an even more comforting dish, with a Greek flair. 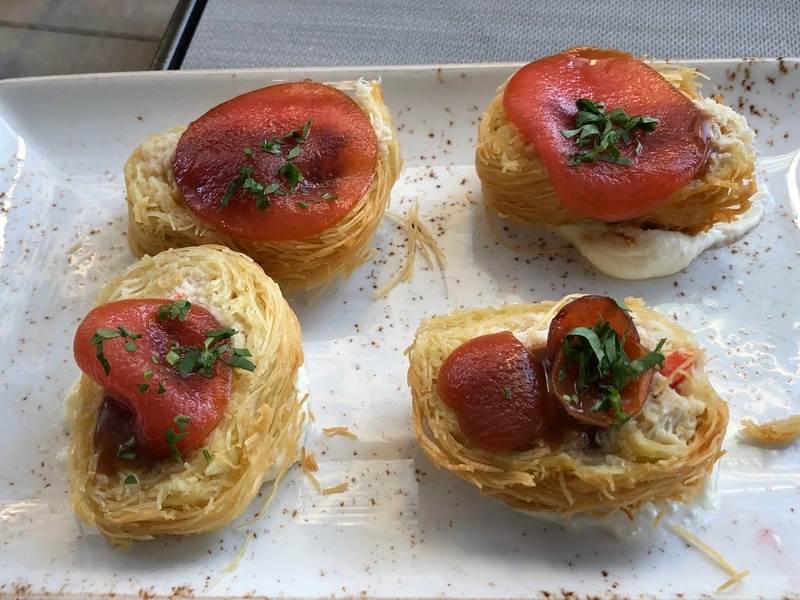 The Crab Kataifi ($16) consists of shredded phyllo, forming a type of nest, golding chunks of lump crab and tipped by a sliced plum. The phyllo sits atop some whipped feta. The various textures and flavors blended well together, from the crunch of the phyllo to the sweet plum. The sweet crab remained prominent, enhanced by the slightly salty touch of the whipped feta. Another winner of a dish. 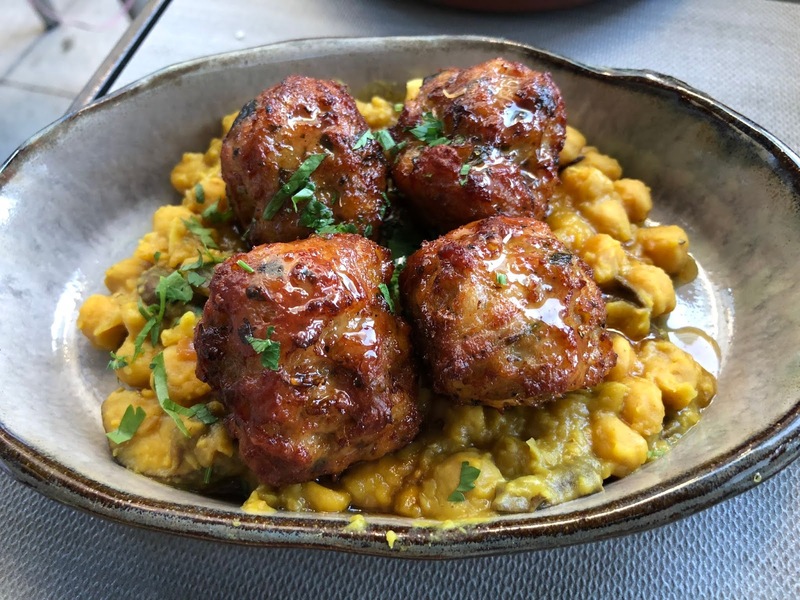 The Keftedakia ($14) are chicken meatballs with smoked honey and sitting atop warm hummus. The meatballs had a slight crunch to the exterior, and the inside was moist, meaty and flavorful, with hints of smoke and sweet. Another well-balanced dish, it went very well with the Xinomavro wine. For dessert, there was Xinomavro Chocolate Cake ($10), with merenda, vanilla ice cream, and a Nescafe crumble. They even put a candle on it for my birthday. 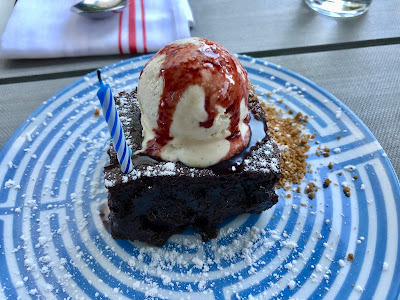 The cake was rich and fudgy, perfect for any chocolate lover, and I've really become a fan of merenda. A fitting end to a wonderful evening on the patio. I've previously given you Ten Reasons To Drink Greek Wine and once again strongly encourage you to drink more Greek wine. And Committee is a perfect spot to enjoy a diverse selection of natural, Greek wines and to expand your knowledge through the experience of Wine Director Lauren Friel. On Wednesday nights this summer, check out their Wine Pop-Up, and I'm sure you won't be disappointed. Giaonhan247 chuyên dịch vụ mua hộ hàng hàn quốc uy tín và là công ty vận chuyển hàng trung quốc uy tín với dịch vụ gửi quần áo đi mỹ giá rẻ với kinh nghiệm mua hàng amazon nhật với giải đáp mua nước hoa chính hãng ở đâu tốt.